We are happy to share with you today’s homily from our friend Fr. Matthew Furgiuele, priest of the Diocese of Gaylord. Today’s Mass readings can be found here. There is a very important lesson for us in today’s readings, especially in light of the ongoing Synod on the Family, as well as the upcoming changes to the process for a declaration of nullity. If you get your information about the Church from the media, and even if you listen to some priests, bishops and cardinals, you might get the impression that things are in flux, and that great changes are upon us. This is not the case and it cannot be the case. As Benedict XVI said, and as Pope Francis himself has repeated numerous times, “Being a Christian is not the result of an ethical choice or a lofty idea, but the encounter with an event, a person, which gives life a new horizon and a decisive direction.” Christianity is not a theory, it is not an ideology, it is a way of life, but it is one which is based on a concrete, living, breathing model: Jesus Christ. As we were reminded during the great Jubilee of 2000, Jesus Christ is the same ‘yesterday, today and forever’. The truth cannot change because it is not an abstraction, it is a person. For our faith to have meaning, both for ourselves and for our society, we need to return always to the source: Jesus. Wisdom is very much linked to prayer, as we see in our first reading, the sacred author prays for wisdom and receives it as a gift. Prayer is necessary for wisdom because Christ is the source of wisdom, and so, we obtain wisdom not by great learning, and not even by experience, but through a relationship. Prayer at its core is dialogue with God, and, most especially with the second person of the Trinity, Jesus. The more we know Jesus, the wiser we become, for it is in knowing Him that we grow in wisdom. As we grow closer to Christ, we see more clearly how everything else pales in comparison, and we see that He alone can satisfy the longing of our hearts. All of creation is good, but nothing created can compare to the Creator. It is not that things lose their value, it is that we value them in the proper perspective: can this or that bring me closer to Christ? If so, it is not merely good, but good for me. If it cannot, then, while it may retain its inherent goodness, it is not good for me. There are very few things that are bad in and of themselves; it is usually not the thing itself which is bad, but the inappropriate use of it. Jesus is the One who can teach us how to make proper use of the goods He has provided us in creation. Deep down we all know that we cannot fool God, but, instinctively, we also know that we cannot fool ourselves. The author of Hebrews knew this so well, and he warned his audience not to play games. This reminds me a lot of the Sheryl Crow song “If It Makes You Happy” in which she says, “If it makes you happy, it can’t be that bad. If it makes you happy, then why are you so sad.” I also think of a poster that one of my co-workers has in her cubicle in Gaylord: “People be like, ‘Only God can judge me.’ I be like, ‘That should scare you.’” There is a great crisis facing the Church, the family and the world, and it is a crisis of listening. We are all so afraid to listen, because deep down we know what God has to say to us. 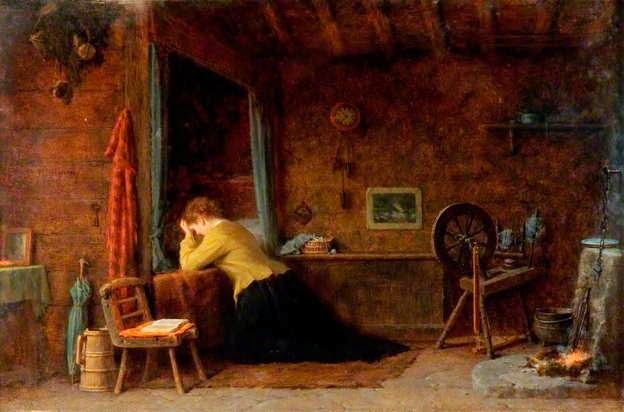 Again, it comes back to the need for prayer: if you don’t spend time with Jesus, then you cannot hear what He is saying, or, if you hear it, you distort it. God is not like we are, He is able to reconcile opposites: in Jesus Justice and Mercy come together: the Cross was the Justice of God, but Christ suffering it became the Mercy of God. In Christ Paul was able to say that when he was weak, then he was strong. One of the most consoling things of all time are the words of today’s Gospel: “For human beings it is impossible, but not for God. All things are possible for God.” Nothing is impossible for God, so, if it does not happen, it means that we are getting in the way. It is amazing how difficult it is for us to let go and to trust in God, instead of ourselves. I see this in confession all the time, people who struggle and struggle and never seem to make any progress, because they continue to try to do it alone, and so experience over and over the sad reality that, by their own strength, holiness is impossible. In our Gospel today we see a wonderful example of someone who talks to Jesus but is not able to listen to Him. The rich young man is a good man, he does keep the commandments, and he even recognizes that avoiding sin is necessary, but not enough, and so, he approaches Jesus and he asks Him what must he do to have eternal life. Jesus knows that the man speaks truthfully, and so He looks lovingly upon him, and He tells him “You are lacking in one thing. Go, sell what you have, and give to the poor and you will have treasure in heaven; then come, follow me.” We have a tendency to think that this was something extraordinary on the part of Jesus, that it is not meant for everyone, but that is not true. Each and every one of you, if you truly speak to Jesus, will hear Him tell you exactly the same thing. Riches are not necessarily material goods, each and every one of us has riches, because we have so many graces and talents from Jesus. The point is not that we have to get rid of our gifts and talents, that would be absurd; rather, the point is that we are all, each and every one of us, called to listen to Jesus and to make sure that every thought word and deed of ours flows from our relationship with Him, and so is according to His desire for us. This is different for each and every one of us, because we are all unique; however, what is common is that we are all called to be disciples of Christ, and to make sure that nothing we do is contrary to that. This is where change is not possible: because Christ is the same yesterday, today and forever, it cannot be the case that something which was Christ-like two hundred years ago is no longer so; neither could it be the case that something which was once an obstacle to being a disciple is now a means of fidelity to the Gospel. This entry was posted in Jesus, Scripture, The Church and tagged Fr. Matthew Furgiuele, homily, Jesus, prayer, Synod on the Family, Twenty Eighth Sunday in Ordinary Time by texasnuns. Bookmark the permalink. When is your next live radio show? Our radio show airs on Wednesdays at 1pm Central time.